Ok, it only took me five days, but I just now figured out Amazon has been discounting HBO titles all week as a part of their “HBO Week.” Which, of course, is now concluding. And someone just told me we ushered a new President into office this week? Yahweh on a biscuit! What else have I missed?! 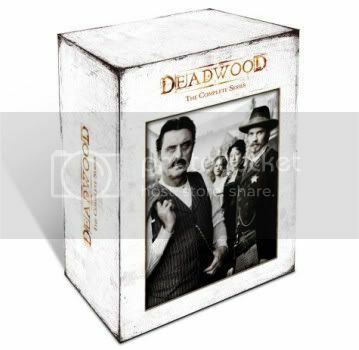 Just for today, Amazon is knocking down the price of the Deadwood: The Complete Series DVD set to $64.99, which is $38 off yesterday’s price of $102.99, and 64% off the list price of $179.97. Deadwood joins Carnivale and Rome in the pantheon of great, geeky TV shows on HBO that got better with each season and were cut short in their prime. In fact, I named it among the top ten most tragic geek tv show cancellations. And what makes it a geeky show? Well, I’m a geek and I loved it. This blog and a personalized autograph from the dude who played Darth Vader should earn me some sort of authority, people. Previous post: Geek Steal: 67% off The Complete Series of The Wire!